Is Too Much Vitamin Water Bad for You? Drinking plenty of water is one way to help protect your health. If you do not care for the taste of plain water, adding a squeeze of fresh lemon juice can enhance the taste. A squirt of lemon will also add small amounts of many nutrients, which increases the nutritional value of your glass of water. Add a slice or two to your next glass, and you can begin to take advantage of these benefits. 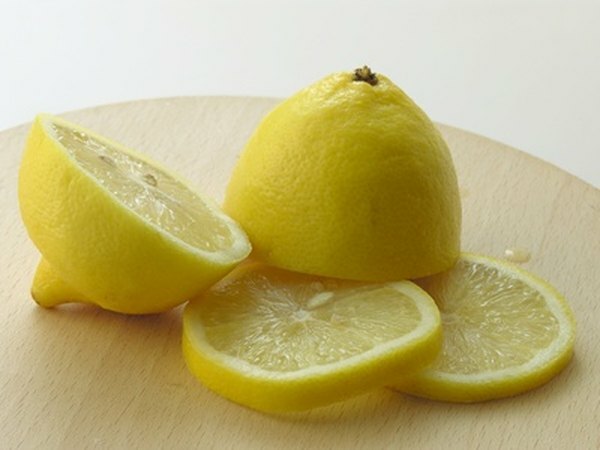 The juice of lemons is often mixed with other ingredients to create cleansers that kill germs and bacteria. John Gray notes in his book, "The Mars and Venus Diet and Exercise Solution," that adding lemon juice to your glass of water can have similar benefits in your body. Foods that contain antibacterial and antiviral agents are able to destroy germs and bacteria that can cause you to get sick. Adding the juice from one-half a lemon to a glass of water each day is one way to begin taking advantage of these health-promoting compounds. The same agents that help destroy germs and bacteria may also encourage your intestines and bowels to work the way they are supposed to. Theresa Cheung reports in her book, "The Lemon Juice Diet," that drinking pure lemon juice mixed with water can help reduce bloating. Cheung recommends drinking a large glass of lemon water first thing in the morning to take advantage of these benefits throughout the day. Lemon water is also used as a treatment for diarrhea because it rehydrates you and helps clear away toxins. Lemon juice contains a wide variety of beneficial vitamins and minerals, including vitamin C, potassium, magnesium and calcium. Including these nutrients in your diet by adding lemon juice to your water can help reduce your risk of certain medical problems. Cheung reports that lemon juice can help lower your cholesterol and blood pressure levels. Gray adds that squeezing lemon into your water can also reduce your risk of high blood sugar. The compounds in lemons help promote healthy levels by reducing the time it takes for sugar to be released into your blood. Drinking more water is a simple way to improve your health and to help prevent certain conditions. The Harvard School of Public Health reports that water is the best beverage for your health because it contains zero calories, fat or sugar. The majority of your fluid intake each day should be water. If you have a difficult time drinking lots of water because it is tasteless and boring, a squirt of lemon can make it taste better and encourage you to drink more. Keep a few lemon slices on hand to help encourage you to make water your beverage of choice.